Dubai ‘at home’ freelance Personal Training expert & Swimming Coach Thane Sparks specialises in weight loss, fat loss, body toning and sculpting, swimming lessons for adults and children, swimming for fitness in Dubai, general fitness for male and female clients and also advanced injury or illness rehabilitation. With more than 13 years of fitness industry experience Thane is well equipped to provide 1-2-1 or group personal training sessions to clients throughout Dubai. Thane provides personalised workout plans based on your fitness goals and these can also include information on diet and nutrition. As a mobile personal trainer in Dubai Thane can come to you at a time and location to suit your schedule. Swim coach and PT Thane specialises in sports medicine, rehabilitation after injury or illness, swimming for fitess (adults and children) and general fitness personal coaching in Dubai. He can provide specialist knowledge and experience for spinal issues (postural related), knee injuries, neck and shoulder rehabilitation after injury. Thane is also an expert when it comes to personal training for a specific goal whether it be for body fat reduction, muscle tone and mass, sports specific training, learning to swim in Dubai, pre and post natal exercise regimes and more. 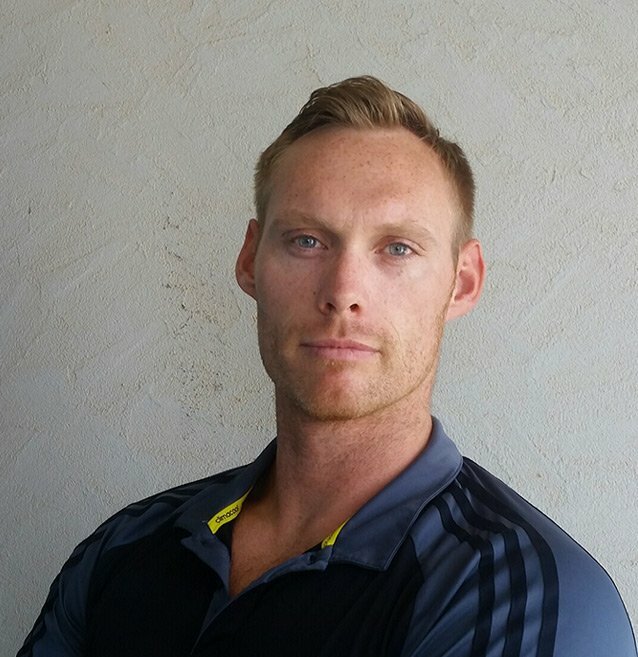 Thane has always been very active and played most sports at a pretty competitive level thus being one of the reasons why he specialises in sports medicine. Whether your training goal is to improve on a particular area of your body or perhaps you need specialist treatment/training for an injury that is preventing you from reaching your fitness and exercise goals Thane is equipped with the knowledge and training experience to help. His training style differs from client to client based on their needs, their personal training goals and the type of support/training they prefer. Some clients prefer their Dubai personal trainer to be more motivational and firm whilst others prefer a relaxed approach. Shane has over 13 years of experience related to the sports and fitness industry. During this time he has gained a wealth of experience and real world knowledge equipping him to provide a first class personal training service in Dubai. Thane likes to use the TRX suspension trainer as he feels it creates a good natural balance and helps eliminate any imbalances. His specialist areas include sports medicine and injury prevention/rehabilitation. He is able to provide personal training for a wide range of injuries, post and pre-op imbalance care and also personal training for other areas like general fitness, weight management, sports specific training and more. If you need a personal trainer in Dubai for swimming Thane is also qualified to work with adults and children in the UAE either on a 1-2-1 basis or as part of a group. TRX plays a huge role in Thane’s training regimes because of the benefits TRX has on rehabilitation injuries or body rehab in general. As well as TRX trainers he also uses free weights and body weight using all different planes. Thane can also incorporate an element of boxing into your personal training plan for general fitness and to improve agility. Thane is a mobile personal trainer based in Dubai which allows him to come to you for your personal training sessions. You can train in your home, your building gym or even an outdoor location like the beach or a park area. His personal service is designed to fit around your time and schedule. Yes I do, a full assessment consisting of body fat, BMI and measurements. This information will help Thane (and you) decide on the best personal training techniques for your individual needs. Yes. There is no need for you to attend your personal trainer sessions in Dubai with any special kit as this will be provided on the day. All you need is comfortable training gear and a bottle of water. Yes. I definitely do help and assist with nutrition and diet advice as it is one of the most important steps to attaining ones fitness goals. Yes. If you would prefer to take your training sessions in a group with family, friends or co-workers then this is not a problem and can often be a great way to get motivated and stay focused on your end results. You can contact Thane using the green contact tab for up to date information about group personal training in Dubai along with current rates. Yes, it is preferred to pre-book your personal training times to avoid disappointment and to ensure your times are available to suit your schedule. If you provide adequate notification (24 hours at least) then there is no cancellation charge. Otherwise you will be charged to the training session. No shows are also charged at the training rate. Thane is currently unavailable. To find an alternative trainer please click here. I have been training with Thane for 2 months now. I have a lower back problem and have some challenges when it comes to exercise due to pain, inability to move in certain ways and some self limiting beliefs when it comes to exercise. Thane has been very respectful, patient and a great support in my rehabilitation journey. He challenges me and understands when I say "no, can't do that". Thane understood my personal goals and never tried to force a norm onto me. I feel safe with Thane as my trainer and would not hesitate to recommend him wholeheartedly to anyone that would like to achieve their own fitness goals. My husband and I signed up for 10 sessions with Thane, and we're now nearing half way through. We have been training together as a couple for years, mainly lifting, and are not new to exercising. However, I have been struggling with some back problems over the last few years, and I needed the extra attention to get back i shape, without risking damage. We are very happy with Thane. He manages to make workouts challenging for the pair of us while considering my special challenges. He is knowledgeable and competent, he listens to our wishes and respects our experience, adjusting the program to our needs when necessary, and he pushes us just the right amount to make it that little bit harder than we would probably do on our own, but always without compromising our safety. TRX-training is new to us and is putting a new challenge to us, working more stabilizing muscles than we usually engage and probably going to push us forward, also in our lifting regime. No two sessions have been the same yet, we enjoy the variation and would recommend Thane anytime.